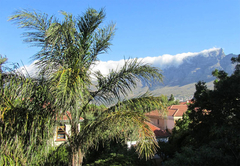 Poyser Guest Suites is a property providing self catering in Tamboerskloof for tourists visiting the City Bowl region. 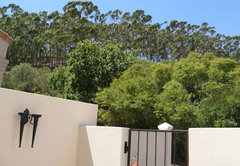 Poyser Guest Suites are self catering suites situated in a security complex nestled in the forest on the slopes of Signal Hill in the fashionable surburb of Tamboerskloof with beautiful views of Table Mountain as well as panoramic views of the cityscape. 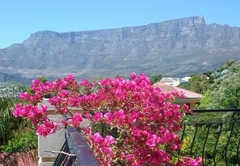 The suites are beautifully decorated with everything you need for an enjoyable and relaxing accommodation in Cape Town. 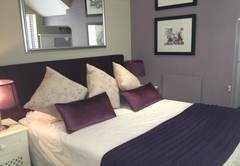 Each suite has either 3/4 or a king size bed, with white soft percale linen. 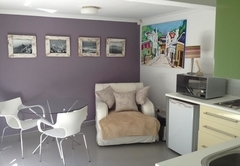 Satellite television and Wi-Fi are in each room. 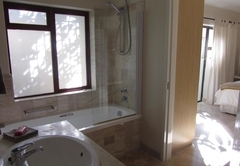 The suites are all en-suite, and have a separate fully equipped kitchen with complimentary tea and coffee. As we are in a security complex your vehicle is very safe as you are. 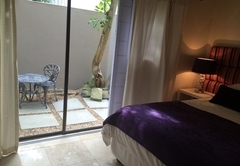 Our rooms are non smoking, however each suite has its own outside private seating area. We will arrange transfers to and from the airport. We have a full laundry service on hand on the property, which is available to all our guests at an additional cost. 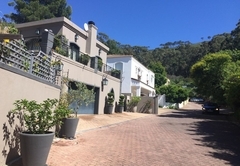 Our location is quiet and tranquil yet very centrally situated being only seven minutes from the popular V&A Waterfront and the CBD but also seven minutes drive from the beautiful beaches of Camps Bay and Clifton. 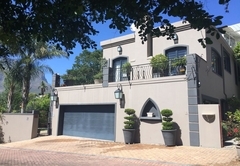 Walk five minutes and you will be in trendy Kloof Street, which has a wonderful cosmopolitan atmosphere where there are many bars and restaurants for you to enjoy. 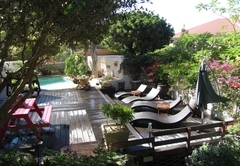 After a day out in the city or on the beach, you can come back and relax next to our sparkling pool, or alternatively head up the mountain outside our gates for sun downers, or wonderful panoramic forest walks. 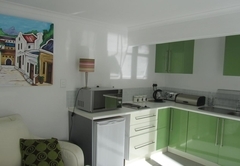 Our suites are beautifully decorated, everything you need for an enjoyable and relaxing stay in Cape Town. 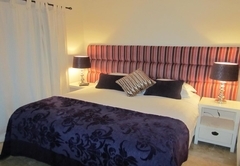 Each suite has either 3/4 or a king size bed, with white soft percale linen. Satellite television and Wi-Fi are in each room. 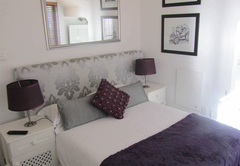 The suites are all en-suite, and have a separate fully equipped kitchen with complimentary tea and coffee. As we are in a security complex your vehicle is very safe as you are. 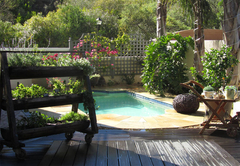 Our rooms are non smoking, however each suite has its own outside private seating area.